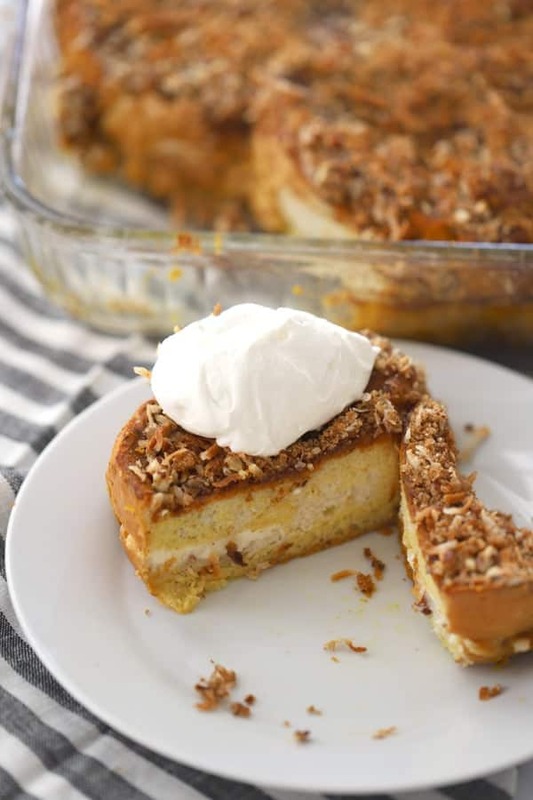 This pumpkin stuffed french toast is filled with sweetened cream cheese, has a pumpkin custard-like, egg mixture and topped with a sweet pecan crumble topping. 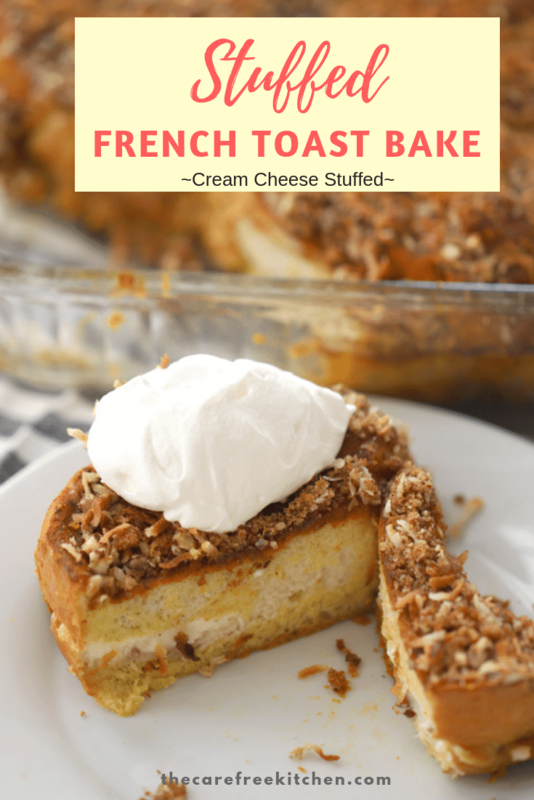 This stuffed french toast recipe is the bomb dot com. It’s a pumpkin flavored custard over french bread, stuffed with cream cheese and topped with a pecan crumble topping. I mean, If you’re gonna do breakfast, this just seems like the right thing to do. This stuffed french toast is best made the night before. 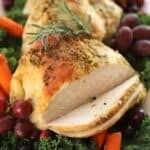 It’s easy to throw together and perfect for the holidays or a special occasion. If you’ve ever wondered how to stuff french toast, Here ya go. I used cream cheese for this recipe. It’s best to start with room temperature cream cheese. I suppose you can use a low fat version of crream cheese but I had full fat cream cheese on hand. 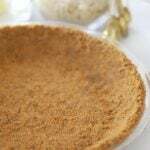 I sweetened the cream cheese just a little splash of vanilla and powdered sugar. Next, I’m using just regular ‘ol french bread. I cut the french bread into thick slices. Next, you’re going to cut those thick slices in half but not all the way through the bread. 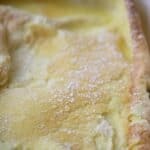 Spread a thick layer of cream cheese in the sliced french bread and set it aside while you make the custard topping. Next, I make the pumpkin custard for the french toast bake. You can throw all the ingredients in a blender or mix it with a whisk in a mixing bowl. 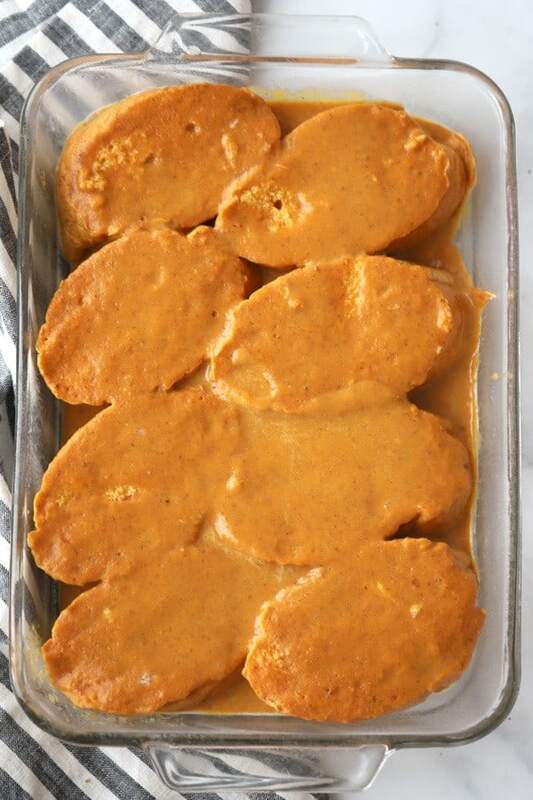 Pour the pumpkin custard topping mixture on the stuffed french toast and then cover it with plastic wrap and store in the fridge until morning. It’s best to take the stuffed french toast out of the oven while the oven is preheating so you aren’t putting a cold baking dish in a hot oven. Let the baking dish come to room temp before putting it in the oven. 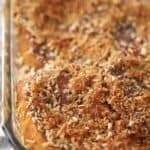 While the oven is preheating you can make the pecan coconut crumble topping. Just thrown those ingredients in a a food processor and wa-lah, it’s ready to go too. The coconut is optional and I suppose you can substitute the wanuts for the peacans, you are going to want a softer nut than an almond. There ya go, easy peasy, stuffed french toast! 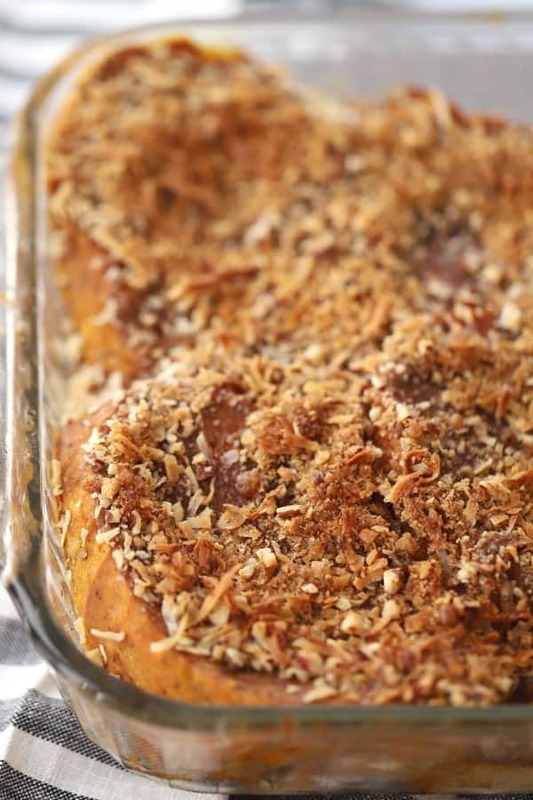 What to serve with your Pumkin French Toast Bake…. 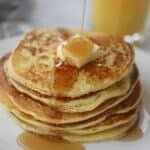 I love making this amazing coconut syrup for this recipe. 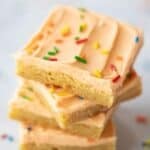 It’s super sweet so you only need a little splash but it is aaaaaamazing!! 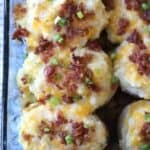 If you’re really into breadfast casseroles, here’s an egg casserole my family loves and breakfast hashbrowns too to satisfy the savory side. Or just add all those breakfast componants together and you’ve got yourself an increadible breakfast feast! In a medium sized mixing bowl, combine the pumpkin puree, milk, eggs, sugar, vanilla, cloves, and nutmeg. Use a wire whisk to beat all the ingredients togerther. Set aside. In a food processor, add the pecans, brown sugar, cinnamon, salt and coconut flakes. pulse until the nuts are to your desired size. It's best if they are ground to a powder, leave a little chunk to them. Spray a 9 by 13" baking dish with non-stick cooking spray. Cut the french bread loaf into 2" slices. You will need 8 of them. Now cut those slices in half but don't cut all the way through. 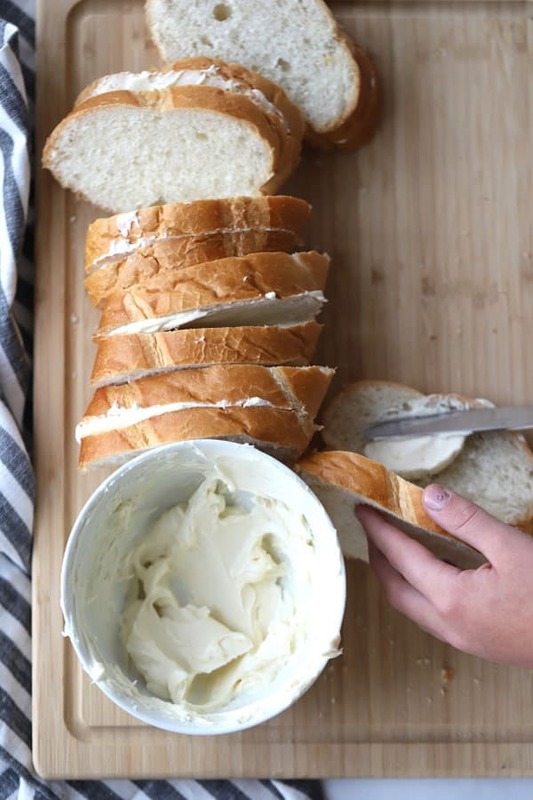 Spread 2 Tablespoons of the cream cheese spread in between the slices of bread. 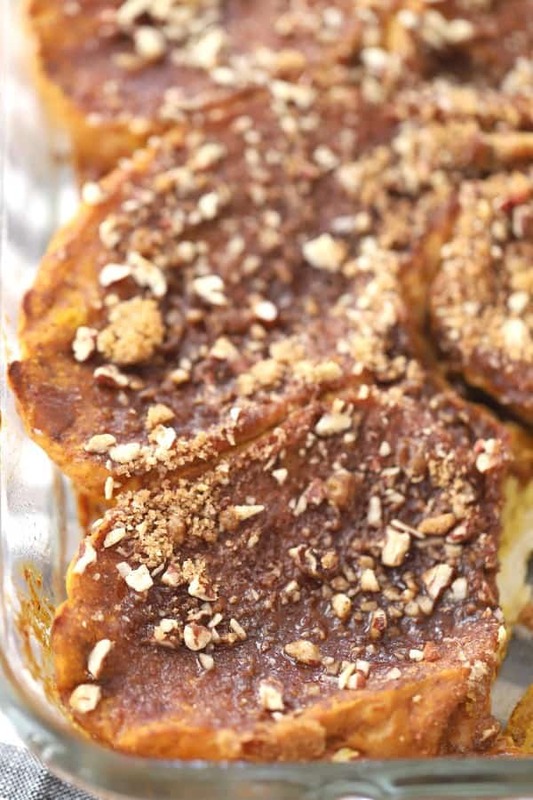 Plave the french toast slices in a baking dish and pour the pumpkin custart over the top of the french bread. Make the pecan crumble topping. Sprinkle the topping on the stuffed french toast. Be sure the baking dish is at room temp before putting it in the oven. Bake in the oven for 25-30 minutes or until golden brown. 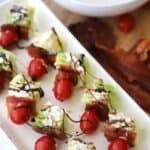 Serve with coconut syrup, whipped cream and some hashbrowns, oh baby! Enjoy!